How is it that September is now just around the corner?! These holidays for me have just flown by and i really don’t have anything to show for it apart from a sun tan..But,I am so happy to say that i have survived my first month of blogging (yey) and with many more to come. I am a lot more motivated now and i’m getting into a routine of posting regular posts and i have chatted to some such lovely bloggers through twitter and on my blog posts, and i want to thank everyone who has read my posts and followed me, i’m very grateful and it really makes my day hearing from you! Anyway, onto this months favourites,its a good bunch! Vaseline spray & Go body moisturiser (cocoa radiant) – This is one of Vaselines newest releases and its safe to say i love it, and will be repurchasing again. The spray element to it makes it so easy to apply and it only takes a couple of rubs and you are moisturised in seconds. So many moisturisers take so long to rub in properly but i can literally moisturise my whole body in 2 minutes flat, it smells great too and it is really moisturising despite how fast it sinks into the skin. This product will be perfect for when its cold and you jump out of the shower and just want to quickly get changed but without skipping moisturising. I have been using this same bottle for almost a month now and i am thrilled with it. Boots Soltan Aftersun – This is a pretty boring product but it really has been a summer necessity for me! I never see much point in spending a lot of money on aftersun as boots own brand one is great,i picked some of these up for £2.50 when they had half price off all suncare. It’s really helped to prolong my tan this summer,it absorbs easily,it cools down any sunburn you may have and it smells like summer!Sold. Schwarzkopf Gliss Total repair shampoo – I’m always trying new hair products and this has been my go to shampoo this month, it claims to repair hair with liquid keratin and is targeted at those with dry and damaged hair. My hair is very long and it is in great condition now but i’m always trying to prevent and limit any further damage, my hair feels soft and looks shiny after washing but to be honest it really is hard for me to tell if a product works these days as i always use Moroccan oil (amazing! ),however i do love this shampoo and again it makes my hair smell great so i would buy this again. Unite 7 seconds conditioner – Nothing but love for this product, this featured in my hair cost post which you can read here. It honestly does what it says on the label and helps to detangle my hair when it’s at its worst. Fully recommend this product if you are prone to tangles or have thick hair. Bourjois 1 seconde & Manicure laser toppings – I wrote about these in full here. I only discovered recently how amazing the fan effect brush which comes with these 1 seconde polishes are, it makes the task of nail painting easy and i will be buying more from their range for sure. Acne Killer Mask – Honestly,this is the ‘creme de la creme’ i suffered really badly from acne and within 2 months it was gone due to using this. Its a painful peel off mask but oh so effective. Read my full review here. Bourjois Color Boost shade 2 Fuchsia Libre – I picked this up on a 3 for 2 offer after hearing lots of bloggers raving about them so i took the plunge and picked up shade 2 which swatches as a glossy bright pink (fuschia), i wont say much about it as i plan to do a full review but so far i love it when its first been applied but then the gloss tends to go as soon as i eat or drink something boo! 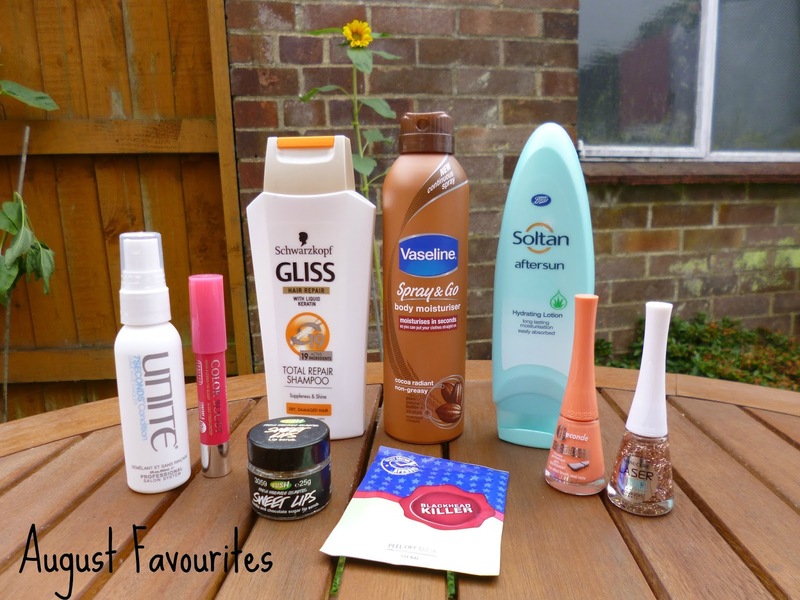 So that’s my first round up of my monthly favourites,i hope you have enjoyed reading it! What do you think of these products? Have you featured any of these in your favourites post?